We are delighted that a new mobile app created by us here at Indigo has been launched by Middlesbrough Council. 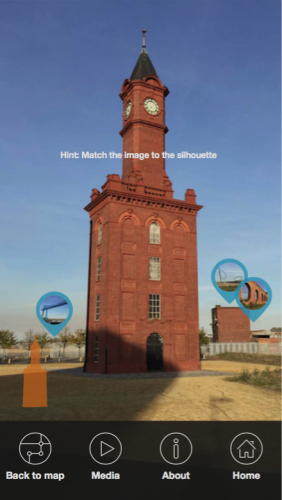 The Tees Transporter Bridge Heritage App brings to life the fascinating history of the Tees Transporter Bridge and Middlesbrough using the latest geo-location and augmented reality technology. The App guides users around the Transporter Bridge and the town on a virtual heritage trail, encompassing more than 30 historical locations and featuring a fascinating cast of characters that lived, breathed and built ‘Ironopolis’. Councillor Charlie Rooney, Middlesbrough Deputy Mayor and Executive Member for City Centre Strategy, said: “The Transporter is one of the great icons of the North East skyline, and a symbol of Teesside’s proud industrial heritage. “The Heritage Lottery Fund upgrades have made it more accessible than ever, both as a working bridge and as a leisure destination, and this new app adds the finishing touch to this important project. Indigo asked a number of local community and history groups to help create the content for the heritage app, and this process helped to identify the core messages and stories to tell. Talented Performing Arts students from Middlesbrough College act out the stories in a series of dramatized aural histories that are presented via the app along with photographs, artworks and text about the location and characters. The Blue Dragonfly pops up throughout the virtual heritage trail, often with cheeky come-backs for some of the ‘men of power’ that are featured, such as Henry Bolckow, John Vaughan, Samuel Sadler and Sir Hugh Bell. She also has her own unique story, which she tells app users as they stand near or on her magnificent structure. One of the themes of the app is to give the user a sense of the impact of the generations of powerful men, the ‘Ironmasters’ who manufactured power in and around Middlesbrough, starting with coal, then iron, then steel and eventually chemicals. A nod to the potential future of sustainable energy production is also included. The app timeline runs from 1829 and the location of Parrington Farm, with the story of Joseph Pease finding the site of what would become Middlesbrough and deciding to buy the land from Farmer Parrington in order to build a new port from which to export coal. Using geo-location and mapping technology, the app leads users on fascinating historical trails around the town. When an app trail location is reached, augmented reality is triggered and used to present dramatisations of key events such as the worker riots on Vulcan Street in the early 1840s, the mythical tale of John Vaughan discovering ironstone in the hills above the town, the eventful unveiling of Samuel Sadler’s statue, and of course the maiden crossing of the Tees Transporter Bridge in 1911. The app also reveals the social and community stories of Middlesbrough, in which women were much more influential. For example the lively interior of the Winter Gardens is brought to life, with a nod to Lady Florence Bell’s desire to reduce the drunkenness of the work force by providing warm and entertaining ‘dry’ places to get out of the cold. The opening ceremony of the Transporter Bridge is narrated by six-year-old Hilda Jessop, the first person climb and cross the top of the bridge. The Tees Transporter Bridge Heritage App is designed to appeal to and be usable by all ages, from school groups, to family groups, to tourist groups with a special interest in history, bridges and engineering. It is free to download from the iOS App Store and Google Play.